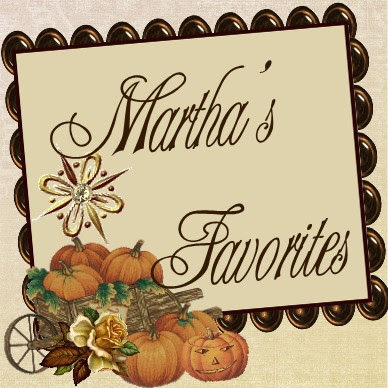 Martha's Favorites: I LOVE A MUSTACHE! TT NO. 22! In 1883, Mrs. Guy Maupassant wrote the following: "Truly, a man without a mustache is not a man." I love how a kiss feels with a mustache! My husband has had one on and off for years. Maybe that is what started me collecting mustache cups? I wish I could say it was that romantic, that simple. No, just another reason to seek therapy, I just enjoy collecting and mustache cups are so much fun to collect. This first cup pictured was the very first mustache cup I purchased. It is made by R. S. PRUSSIA. Since that country no longer exists, the beautiful china they produced has become highly collectible and valuable. I purchased this cup at an Estate Sale. I had never seen one before, so I thought this cup was very unique. I later learned everyone made these cups. 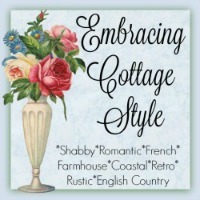 Although hard to find, a good antique house will always have one. What I find most interesting about this cup is the beautiful floral print. I don't know about your house, but rose printed cups would not be Kelly's first choice. He is more of a large plastic, throw away cup, type guy. His first chose would be a 7-11 cup. I guess things must have been a little different back then. Because, I am told these cups were a must have for every gentlemen. This cup is a can shape with a Old English stepped handle. I am choosing this one as my favorite, because it was my first! Cup number two is my "Father Cup". 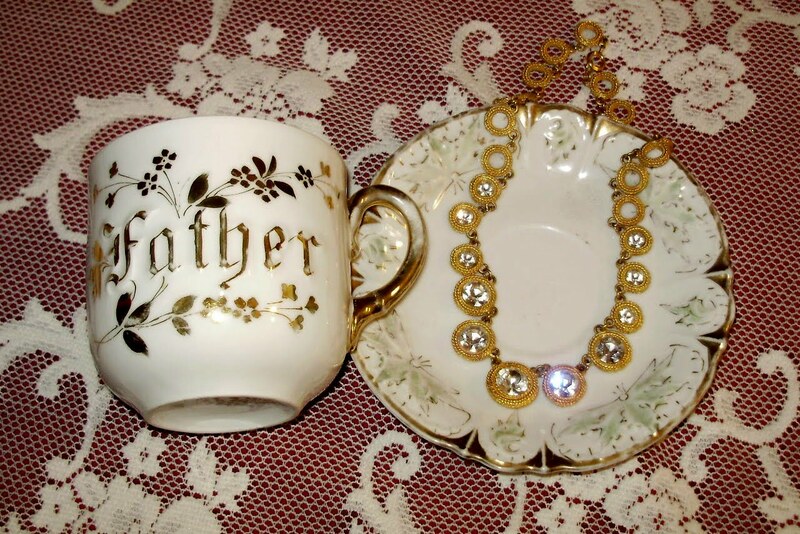 Mustache cups with mottoes were a fad in the late nineteenth century. 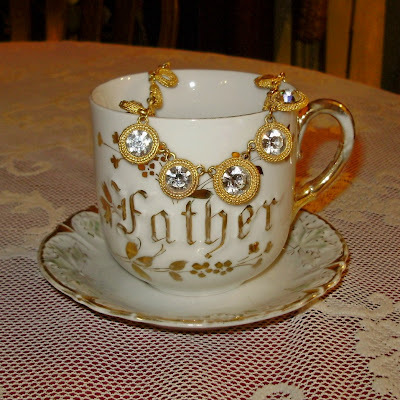 One common example was the "Father Cup". I was lucky to find one. The cup was made in Bavaria. It too, is a can cup with a gold loop handle. It is very pretty. Take a look at cup number three. 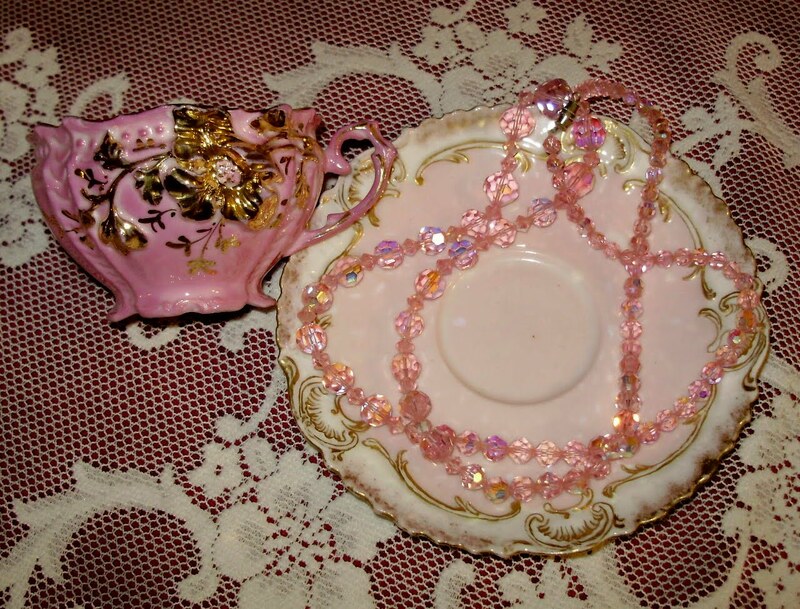 It is a very dainty bone china, It is also very pink! I don't know why ladies, I have no answer for this pink colored cup. It is so ornate. What I did find out, was that every gentleman had the china maker, who would customized their cup to fit their mustache. That makes this cup all the more interesting. It is really quite beautiful. It is German and it is marked 666 1/2. Interesting! The cup is fluted with a small pedestal base and a ornate gilt handle. Isn't stunning? Cup number four is Bavarian. It is also a motto cup,"Think of Me". Wouldn't you have loved to receive this as a gift? It is a rounded cup with a loop handle. This cup is Lusterware. It reminds me of something that could easily be a scrapbook design. Look at it closely, don't you think that pattern could be easily done on paper? The cup at the top of the post is also German, c.1890. It has a rounded cup with a ring handle. It also has large applied gold flowers and leaves on the surface to the cup. Very over the top! I showed you this one before. I thought it was worth a second look. 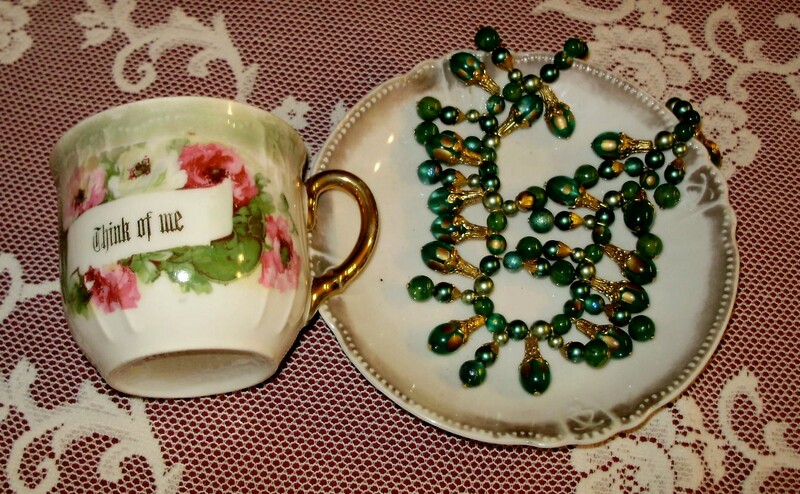 Mustache cups are fascinating to collect. At one time practically every household had at least one mustache cup. Today, collectors treasure them for their beauty and historical significance! Well, I hope I gave you a love for the mustache! 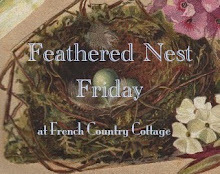 Thank you for joining us once again this week. You know what to do with Mr. Linky. 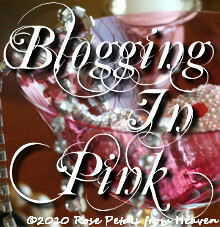 I also want to remind you to visit my dear friend Terri, http://artfulaffirmations.blogspot.com/. She is the brains in the blog family! She has an amazing collection and if you look real close at her blog, you will notice she has great toes too! LOL! Have a wonderful week, my Tea Cup Friends! Blessings, Martha. You have a fantastic collection of moustache mugs and of course, this does not surprise me a bit. You have wonderful taste, and I always look forward to seeing your tea cups. 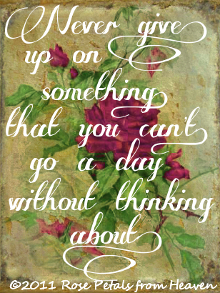 Thank you for always being our faithful hostess each week~ Love and hugs~ Vicki p.s. I always love your blog headers. These are absolutely gorgeous! What a wonderful collection! How interesting and pretty you mustache cups are! Thank you for hosting. My cup is really more of a glass, but it is old. How very interesting, I have never seen one of these before and I was intriqued by the history. My husband has a mustache but I couldn't see him drinking out of one! LOL He is a big coffee drinker with big cups. LOL Have a great evening! What gorgeous mustache cups, Martha! I love a mustache too. My hubby has always had one and I won't let him shave it off. Have a wonderful week, m'lady. WOW, now I have some tea cups however NOTHING like these...how neat to share with us Martha...they are beautiful! 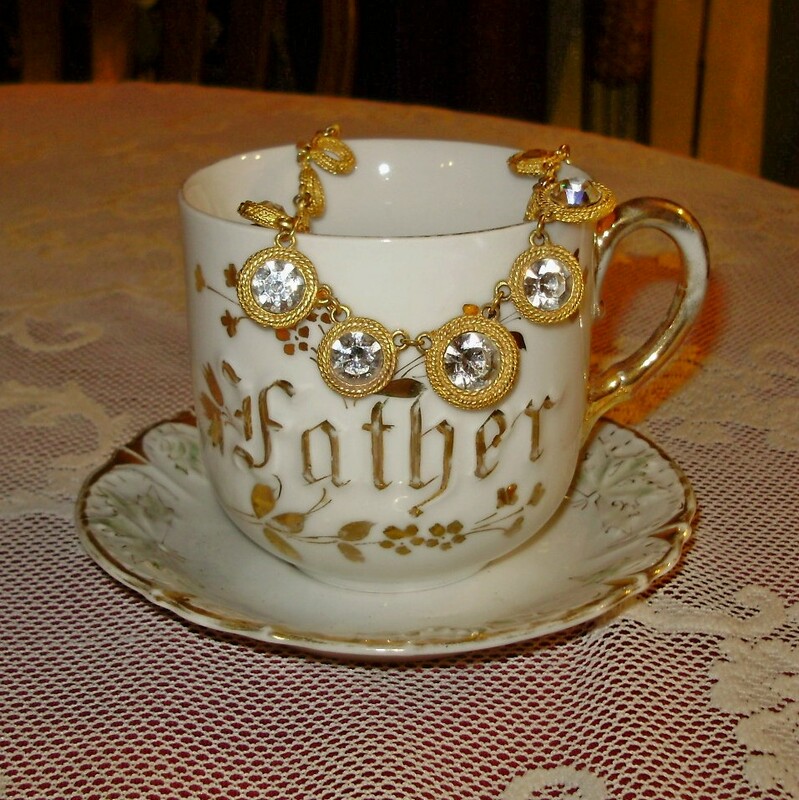 Those mustache cups are gorgeous and so is your jewelry. I love the pink crystal necklace and that first white and gold cup is stunning. I must have not had my speakers up before because I'm now hearing your wonderful music! So many of my favorites!! Especially America the Beautiful by Ray Charles - always gives me patiotic goosebumps!! 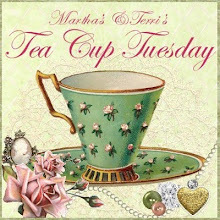 As usual your teacup tuesday post is over the moon fabulous Martha! I love these darling and whimsical Victorian moustache cups; (I have only one).~ What a fab collection you have; so pretty! Thanks for co-hosting, 'Teacup Tuesday' and sharing once more dearest 'teacup-lady', Martha! 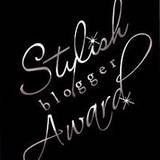 Always love my visits to your sweet blog! Oh, stunning is the word, Martha, for your incredible tea cups today. That pink one is a heartstopper. Oh, what I wouldn't do to see all your cups in person, as well as how you store all of them. Those are all beautiful!! I especially love the pink one...but I'm sure that would not be my husband's favorites. He's not quite the 7-ll Big Gulp guy...just give him one of those large travel-size coffee cups. Anyhow, would you believe that I didn't even know mustache cups existed until about six weeks ago. I have only recently gotten into antiquing, and on my first visit to an antique mall, I discovered these beautiful cups. 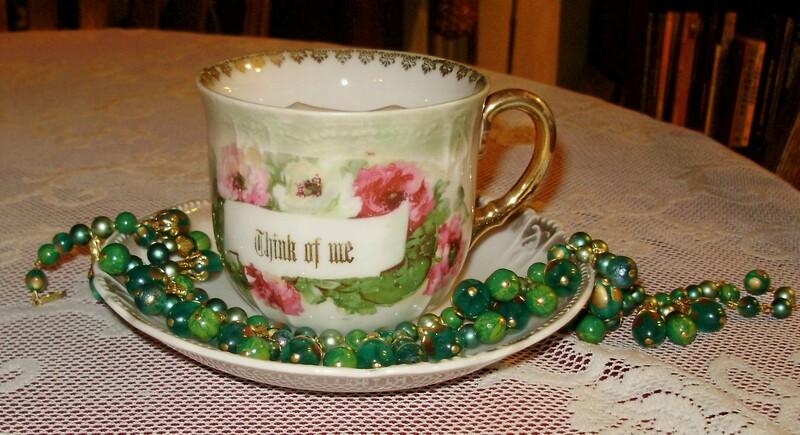 Well, I wish you a wonderful day...and, as always, thank you for hostessing this lovely tea party. 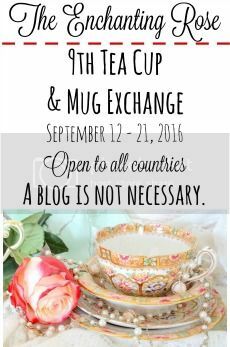 Hello Martha, I'm joining Teacup Tuesday for the fist time today. 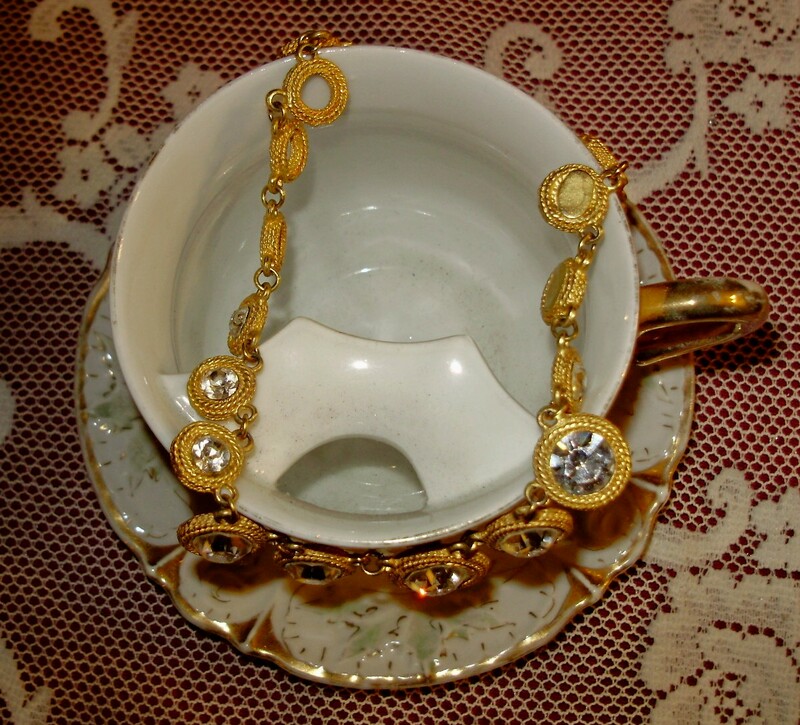 The mustache teacups from your collection are very interesting and pretty. I've never seen such cups before. They made me think of Hercule Poirot, a Belgian detective from Agatha Christie's novels. He was a true gentleman with the most elegant mustache ever. I love all your beautiful Moustache cups and yes, they are all so pretty and dainty for a Man. Isn't it strange, how they do not have them nowdays and yet such a great idea. The Victorians may have been ahead of their time. I love each cup and had no idea that moustache cups could also be so beautiful. thank you for sharing. I pray this finds you enjoying the peace and rest of our great God. 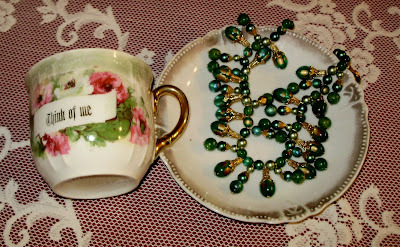 I have never heared that name "Moustache",I Call them coffe cups ,they are smaller than tea cups,isn´t it? 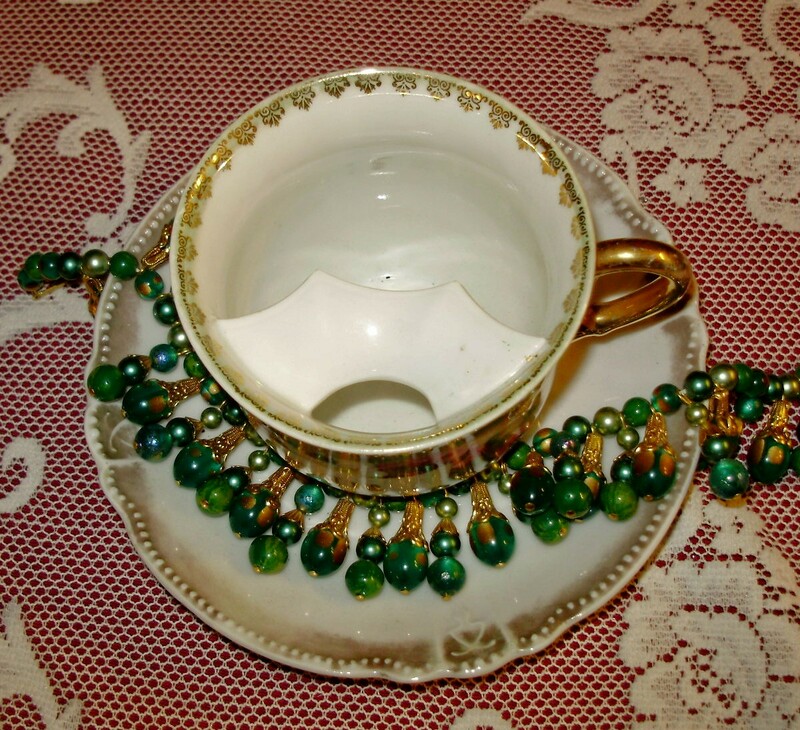 Mustache cups are interesting and although I have heard of them, never paid much attention. 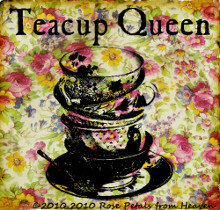 Thank-you again for hosting Teacup Tuesday. I have never seen that mustache cup before. My, your collection is making me drools. Love to see your unique teacups. Thanks for sharing. Martha, elegant! They're beautiful! I'm going to go have another look at the mustache cups! Mine's a lonely little offering today. Hello Martha- Wonderful mustache cups. I have been looking at a few of them in the antique store lately. I think I might have to pick one up now. Thank you for all of the information. I had no idea they had them fitted to their mustaches. Take care. 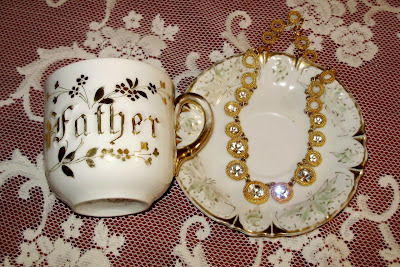 The Think Of Me cup is to die for...I once saw one similar to the "Father" cup on ebay years ago - it had very similar lettering, but it said "Mother" - obviously the Mother one was not a mustache cup LOL - it was one of those things that sticks in my head that I regret not buying when I had the chance! Those are the prettiest mustache cups! My husband has a mustache at the moment so I am partial to them, too. You have a lovely collection, Martha! This post was so much fun! mustache cups!!! YeeHaw!!! 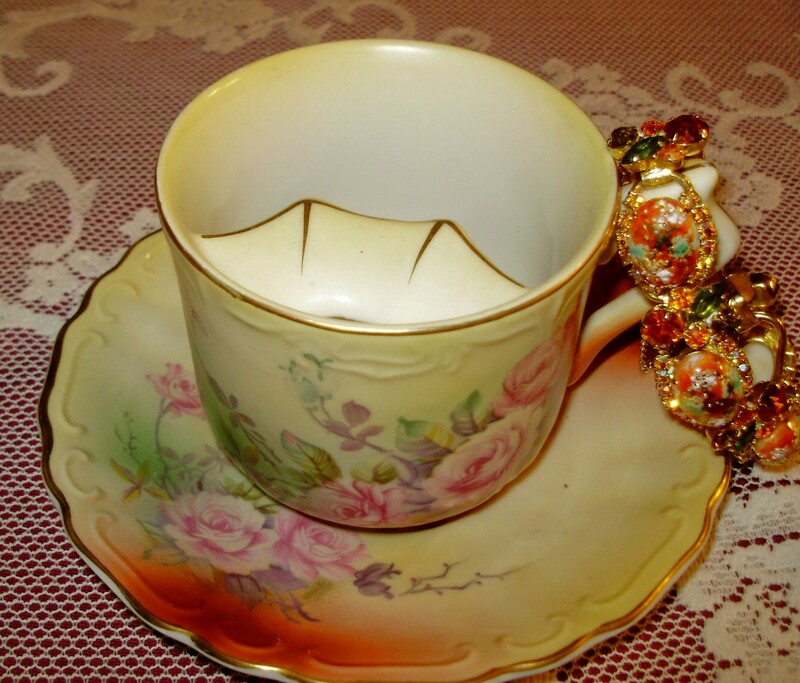 Love these mustache cups, they are so lovely! 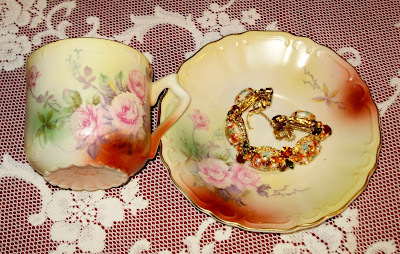 I just love my teacup collection, it makes me so happy and I love to see everyone else's collections. What a darling collection, Martha. 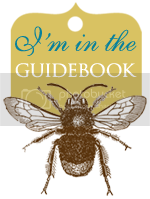 I am hoping to participate in Teacup Tuesday each week and showcase some of my favourites over the next few months as well as some I have up for sale on Etsy as my collecting got rather out of hand and needs to pare down some. These are quite beautiful. 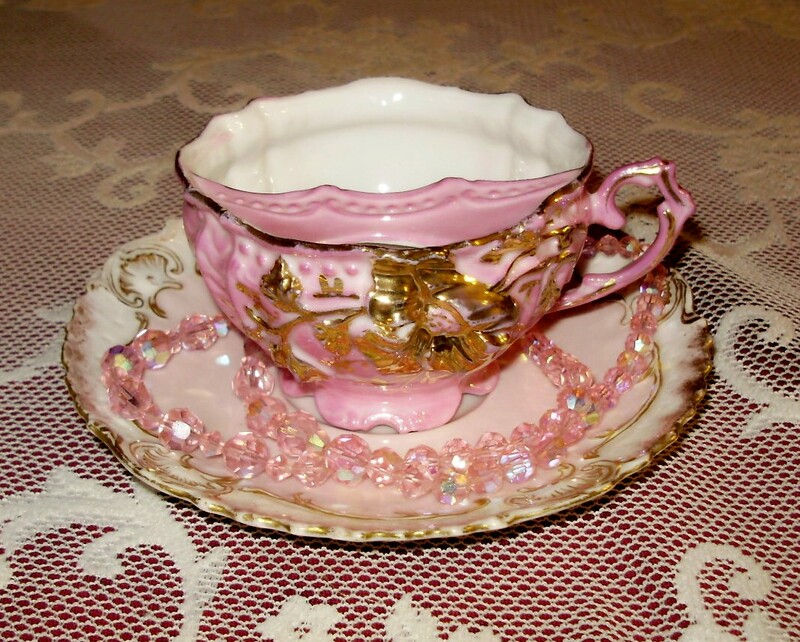 When I see mustache cups it always puts an image in my head of big burly men with mustaches drinking from such beautiful, flowery, danty tea cups. I love the contrast of that. I have one or two of these types around here...I think as a gag I'll serve him his coffee in one in the next few days and see what he says!!! I have never heard of , or seen a mustache cup before. How fun is that? You have a lovely collection. I love the moustache cups! My hubby has a moustache and I agree about the kissing! Isn't it lovely how genteel gentlemen were back then. Hi Martha!! Sorry I wasn't able to be in this weeks party. Have been so busy getting my craft room together. But I had to stop by and see what everyone is sharing. I have never seen a Moustache cup! Geez! I learn something everyday! That little pink one is so pretty! A man would dare to drink out of that dainty thing? LOL! Keep smiling and have a great week!! Hugs! I am so impressed at your knowledge of this very interesting subject!! 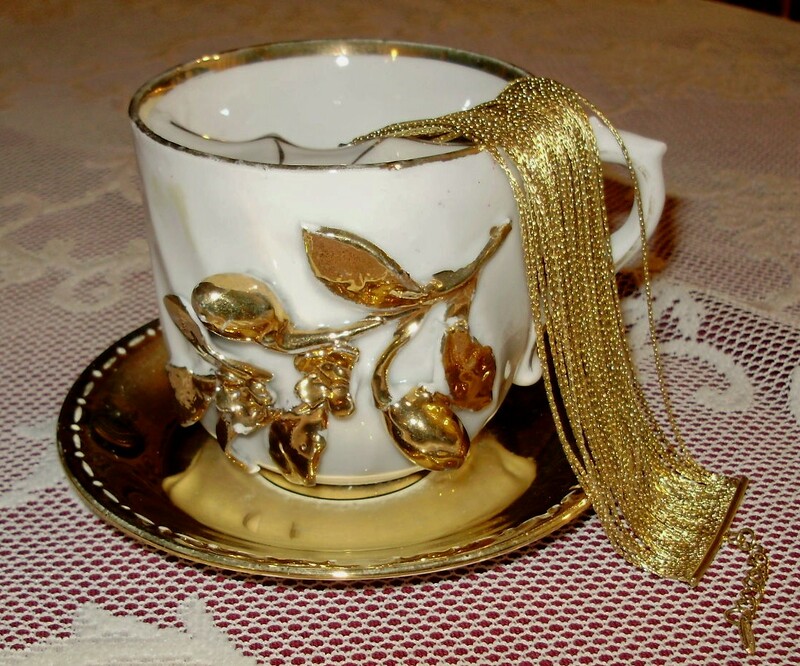 I can't beleive that gentlemen in this era used these very ornate cups!! But it was a very elegant era and there must have been a different mind set back then when it came to gentlemen. Joe does not drink tea. He likes his 3-4 mugs of coffee in the morning and then he is a Diet Soda drinker for the rest of the day usually from a bottle almost as big as a liter!! I can dress him up but I really can't take him out!! LOL!! I adore those mustache cups. I've never seen any like them. They are so rich in color and detail. And although I'm not fond of pink, I really loved the finish and design on the pink one. 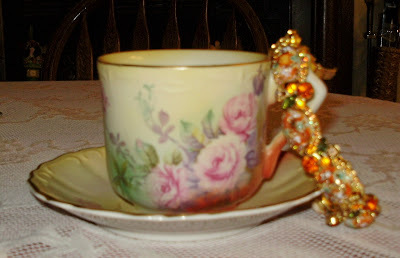 Yesterday, when I was celebrating Tea Tuesday with a couple of lovely cups you might admire, I told my readers about yours and Terri's Tea Cup Tuesday. I hope a few of them came by to see what it is all about. I love the cups, I have 2 in my Tea Cup collection and you know what they say 3 or more and you started a collection, well I'm close and I'm a serial collector as well! Thanks for visiting my blog, I find there isn't enough time in a day to see all so I figure on about 12 a week for me, eventually I'll see them all. XOXO Your collection is to die for! Hi Martha, Talk about improving computer skills, I accidently deleted my first comment so I put it back on, sorry, I didn't know how to fix it so I just put it on again. Whoops!! I never knew there was such a thing! Imagine that. They used to make dishes for EVERYTHING! Hope you are doing well. I am sorry I haven't been by to visit lately. I seem to go through spells where I don't blog at all. 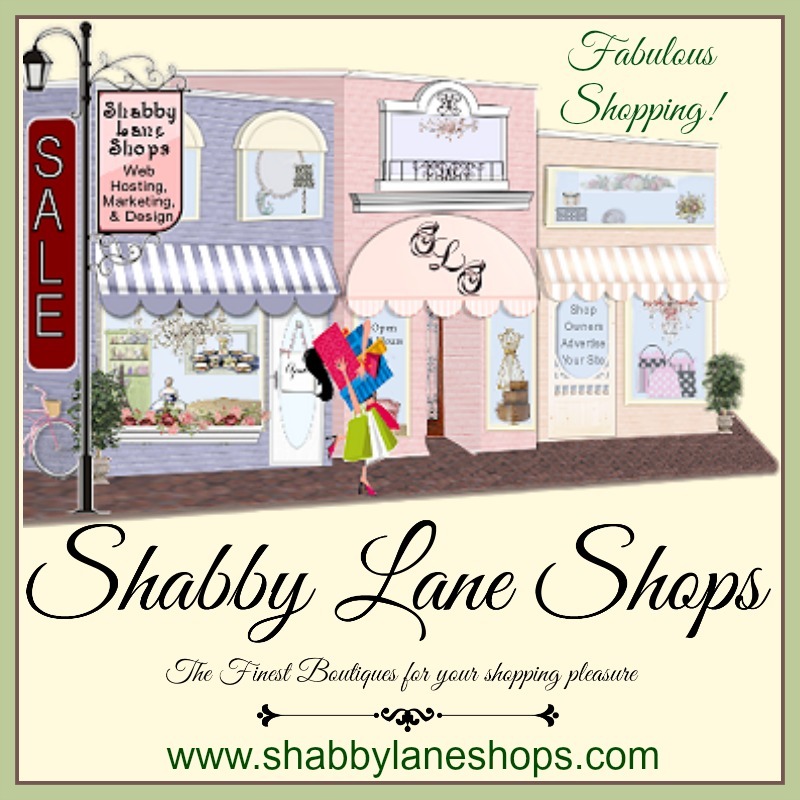 Your cups are gorgeous and the new look to your blog is so fresh and pretty! Hello Martha, I'm intrigued as I have never seen one till now. Thank you so much for sharing and as usual you have impeccable taste. Great mustache cup collection Martha! Isn't it amazing how feminine they are? I agree, it must have been different then, men today would never drink from one of them! I saw quite a display of them in an antique store on my trip. Some of them truly ornate and beautiful, like yours. Thank you so much for showing us these cups. What a beautiful share. 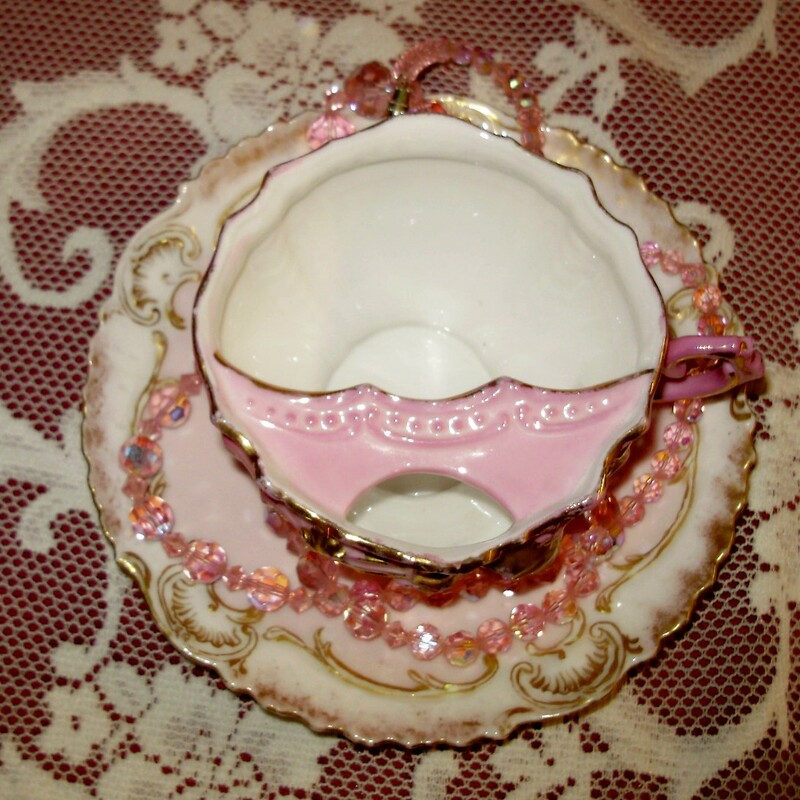 I am so in love with that pink moustache cup. Now that one is so elegant. I somehow cannot imagine a man drinking from it, as it is so darn pretty, but each to their own. I love the way you have them draped with beads and decorative pieces. You have them displayed so beautifully sweetie. Thank you so much for sharing with me today. I have enjoyed this stroll immensely. 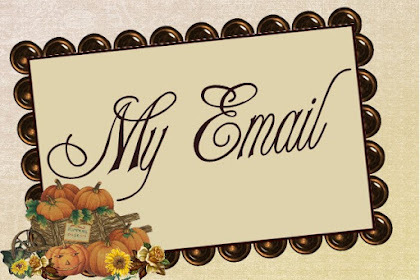 I have added your blog to my favorites.